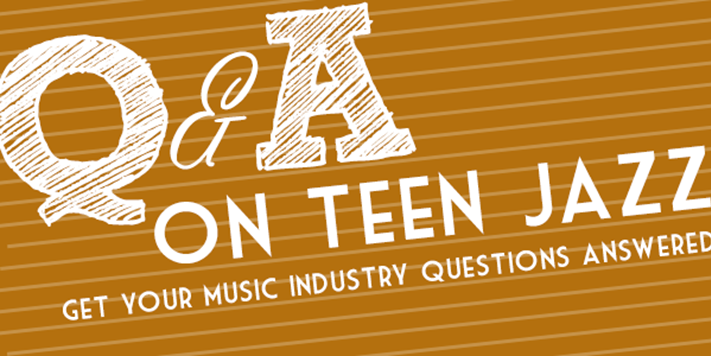 We’ve decided to start a new series on Teen Jazz where we answer specific questions that have been submitted by our readers. If you have a question about music, performance or the music business, please feel free to post them in the comments! WHAT SHOULD I FOCUS ON DURING JAZZ PRACTICE? The goal of practice, regardless of genre, is to focus on and develop skills that need improvement. That’s what differentiates practice from playing which is playing things you already know. To practice “jazz,” there are a few things to practice that are specific to the genre such as the ability to read chord changes, improvisation and style. It helps to keep a practice journal where you create a list I things you want to work on and your progress with each. So, for example, if I were just starting out, my first few goals may be to find a few jazz players who play my instrument and listen to their recordings, learn the chord tones and scales for the chord changes for a few songs as well as their melodies (good beginning songs are blues, Summertime, Song for my Father, Perdido, Four, Watermelon Man, Cantaloupe Island, etc). At a slightly more advanced level, I’d maybe work on transcribing, etudes of various difficulties, and start to attend jam sessions. It also is very beneficial to work with a private teacher. DO YOU INVITE PEOPLE TO A JAM SESSION? The answer to this question depends on your role at the jam session. If you are running the jam session, it is, in part, your responsibility to invite other musicians to attend. If you are only attending the jam session as a guest or to sit in, you are not obligated to invite others, but it’s always a good idea (if it’s an open event). Not only will you get to sit in and jam with your friends, but you’ll also please both session leader and venue. 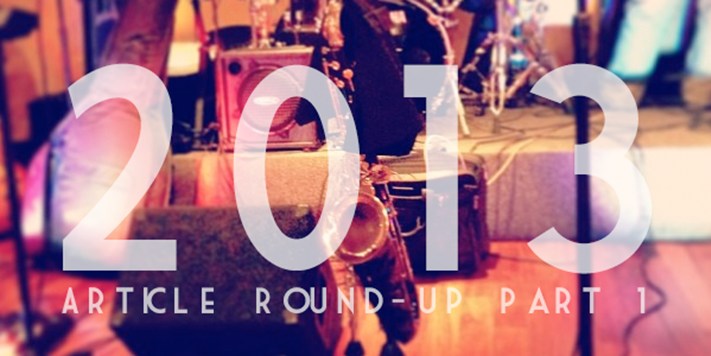 The more patrons a venue has, the longer it will continue to host the jam session. So if it is a jam session you enjoy attending, by all means, invite your friends! If you’re looking for a jam session in your area, check out our Jam Session Directory here. We’ve interview several musicians throughout the nearly ten years we’ve been in existence. As part of each interview, we ask the musicians what their advice would be to an up and coming musician. You could get this information by reading each interview individually, but we made it easy for you by combining all of the advice into this eBook. 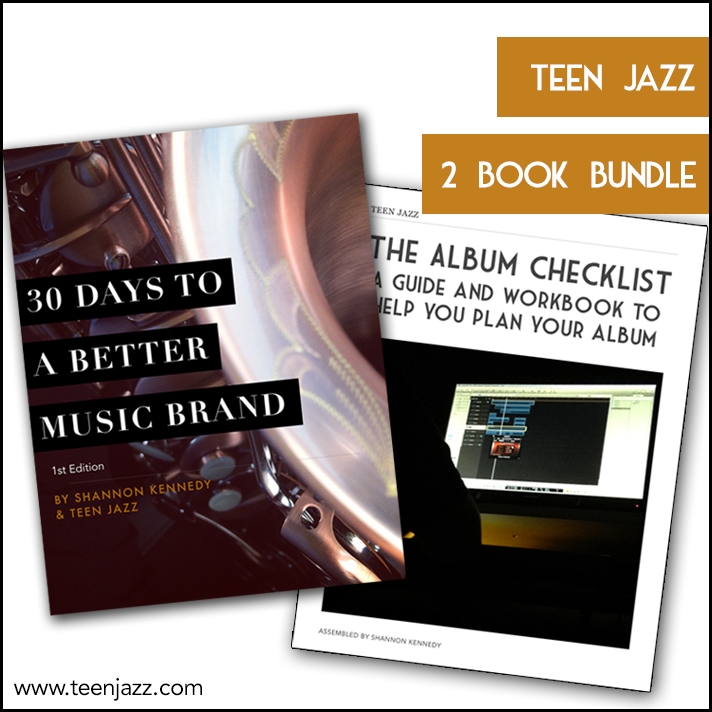 You can get our album planning guide and workbook here. This article originally appeared on my foreign language blog, but I thought that it would be great to include it here as well. I’d like to share a few productivity apps that I use on a daily basis (or have used) to help manage my music projects and tasks. 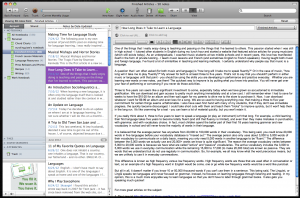 There are three applications (I list a fourth in this article that I no longer use) that I use on a daily basis to help keep organized (and the best part is that all of them are free!). Update: Teuxdeux is no longer free. It requires a monthly subscription of $3 or $24 a year. I only recently started to use these various programs, but I cannot imagine working without them now that I’ve started to use them. 1. 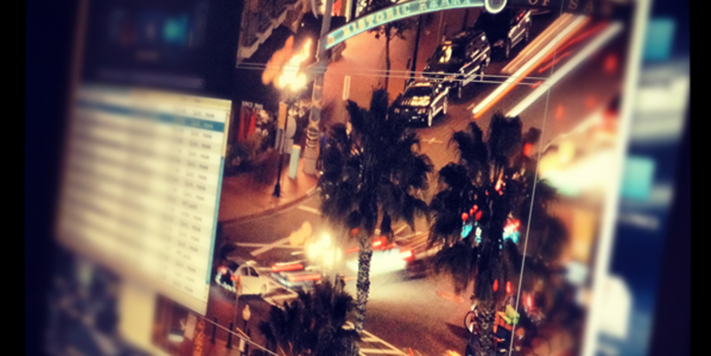 Evernote – I have no idea what I would ever do without Evernote. It keeps all of my article ideas, song lyrics, chord charts, lesson materials, language notes and resource lists, design inspiration, and recipes all in one place! I have everything divided into notebooks and documents so that everything is easy to find and I have the free app on all my computers and mobile devices (free for both). 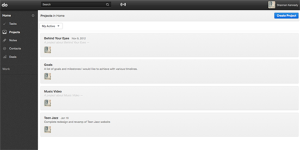 I can create voice memos, video memos or written memos and I can even email ideas to others through the application. The possibilities are endless! Get Evernote. 2. Teuxdeux – Teuxdeux is a very simple and intuitive to-do application that allows you to create and modify a daily list. 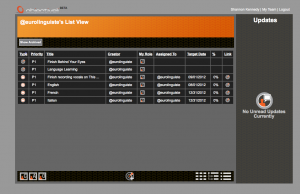 It gives you a five-day view and allows to you can move items around and jump ahead to assign future tasks. In my opinion, however, the best part is that it automatically transfers unfinished tasks to the next day. It also gives you a panel at the bottom called “someday” for those tasks you need to complete, but you just don’t know when you’ll get around to them. And yes, I know I didn’t do a whole lot on Monday (like I said we’re in the middle of moving)! Get Teuxdeux. 3. 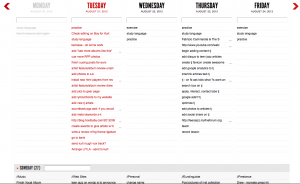 Do – Do is my preferred project organizer. There are a lot of different apps that are similar, like Wunderlist, but I like the design of Do and I’m comfortable working in it. Do allows you to set up several different project templates and within each project, you can set up smaller projects with task lists. For example, I would set up a project template for an album, then set up a smaller project for each song with the tasks I need to do to complete them (record bass, write lyrics, mix, etc.) You can also collaborate with others and invite them to contribute to each project. Unfortunately, Do doesn’t exist any more. 4. Trello or Objectiveli – I know that I said three, but I used to use this fourth app until I found Do. I think Trello is great for those who are more visually oriented because you can include photos along with your projects. Trello and Objectiveli are slightly different in function, but I seem to use them in the same way, so it’s more a matter of preference. In my opinion, Trello is a little bit more user friendly even though it is geared towards project management whereas Objectiveli is difficult to navigate, but is set up as a way to manage and monitor your goals. Either way, I think they are both really great tools for setting up learning goals/projects and monitoring your progress. Both the computer version and phone version are free for Trello and to my knowledge, Objectiveli is only available online, but is also free. Objectivli is a great app for setting goals and helping you accomplish them.As you can see, I only recently started using these two applications for language (although I’ve used them more for music). 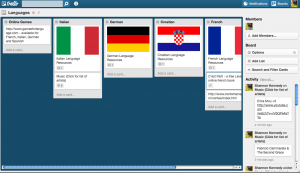 If you want to join my Trello language resource board, let me know and I will add you as a member! What are some different tools you use to keep organized? Last week I had the opportunity to see not one, but two music legends perform. The first concert I attended was that of George Benson at the McCallum Theater in Palm Springs on February 16, 2013. The second was BB King at the House of Blues in Anaheim on February 22, 2013. Both of these guitarists (and vocalists) have led extremely successful careers, so it got me thinking about what it is that they’re doing. How is it that these two musicians have remained successful over several decades? What is their formula for success as performers? George Benson and BB King are both legendary musicians, but why? What exactly are they doing that sets them apart from the thousands of other guitar players whose careers have come and gone while theirs have endured? The easy answer is “they are both incredible musicians,” but it takes a lot more than that to have a career as prodigious as theirs. 1. It is not enough to be an outstanding musician, you also have to be an outstanding performer. You may be able to take an impressive solo, sing higher than your peers, or have incomparable technique, but that’s not what sells tickets. The performance and the performers sell tickets. People buy concert tickets to see a show. They want the musicians to interact with them and do more than merely play what’s on the album while standing still on stage. They want to be entertained and that’s exactly what George Benson and BB King do. They are both outstanding and engaging performers. 2. Play what the audience expects to hear. When people go to see George Benson or BB King perform, they don’t go to hear something new. They go to hear the songs they love, that they can sing along to at the top of their lungs. They want to hear the hits like BB King’s “The Thrill is Gone” or George Benson’s “On Broadway.” Yes, it’s nice to hear something new and unexpected, but if the audience walks away without hearing the hits, they’ll walk away disappointed. 3. Pay attention to your audience. When you’re performing, pay attention to what gets the audience going. If you play a solo note for note the way it is off the record, does the audience grow excited because they know what’s coming? When they hear the intro to one of your well-known songs, do they start to clap? 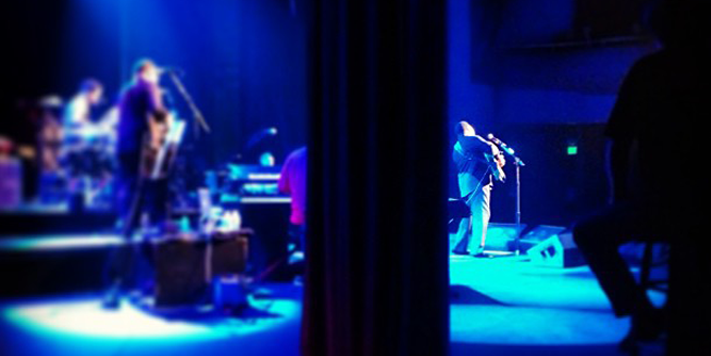 Both George Benson and BB King listened to what the audience responded to and made that a part of the show. The two performers had signature dance moves that they incorporated into the show that really got their audiences going, so much so that the two would even stop in the middle of a solo to work it into the performance. Every time the audience would scream, laugh and clap. Find out what your audience responds to and do it. It may be something different for each performance, so that’s something to be aware of, but whatever it may be, find something! 4. Engage with your audience. Talk to them, thank them for being there, ask them how they’re doing and if they’re enjoying the music. Don’t let the stage create a boundary between you and your audience, interact with them. At the end of BB King’s show, he allowed a significant portion of the audience to walk up to the stage, shake his hand and hand him things to sign. Now that’s something the audience is going to remember. 5. Give your listeners a unique performance. You need to give your audience a reason to go and see you perform as opposed to some other XYZ [insert your instrument here] player. What makes you different? Figure out what that is and use it to your advantage. 6. Each performance should be your best. Regardless of the conditions on stage (the sound is terrible) or the situation backstage (you and a member of the band are fighting), you should always do the best you can to give your audience a stellar performance. 7. Even if you’ve played the songs 100 times before, play them like they’re still new and exciting. Even though George Benson and BB King have been playing their hits for decades, you’d never know. They play them with the same energy as they do their newer material. If you look bored on stage, the audience will see it and it will affect how they hear the performance. So what do you think their secret to success is? 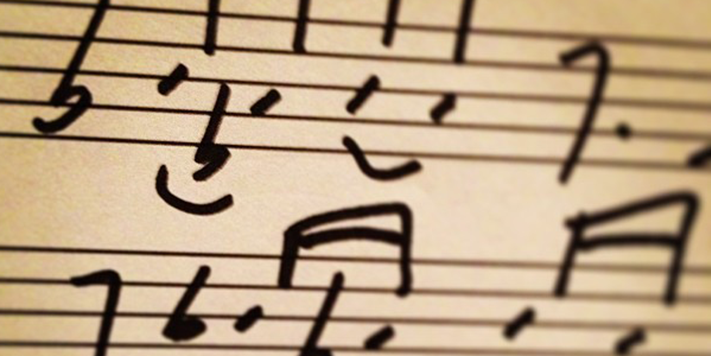 Here are some jazz phrases that we like and found entertaining. There are so many more than what we’ve listed here, so feel free to add your favorites in the comments! The Apple – New York City. Bag – A particular interest. Balloon lungs – A wind player with plenty of air. Birdbrain – Someone who imitates Charlie Parker (I think we should start using “Breckerbrain”). Blow – Slang for playing an instrument. The Bomb – Very cool. Burnin‘ – An extremely excellent solo/performance. Cats – Those who play jazz. Chops – The overall ability to play an instrument in a very skilled way. Also refers to a brass players facial muscles. Clams – Mistakes made while playing. Combo – A combination of musicians that can vary in size (anywhere from 3 to 10). Crib – House/home. Also known as pad. Dig – To know or understand. 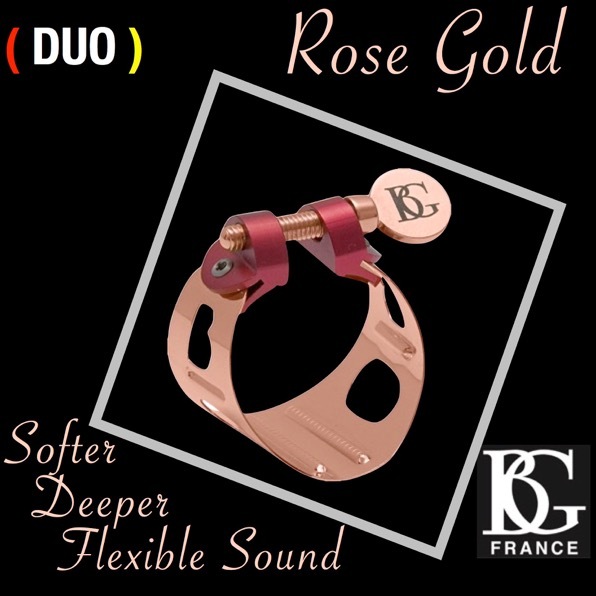 Finger Zinger – A musician who plays a whole lot of notes fast. Flip – To go crazy. Gig – A paying job. In the Pocket – When groove is really together Jam – Improvise. Jive – Phony or fake. Licks – A term for a phrase of music. Noodlin‘ – Playing a bunch of notes that don’t mean anything or are out of context. Popsicle Stick – A sax reed. Scene – A specific place or the general atmosphere. Smokin‘ – Playing your booty off. Solid – The band is playing tight. Square – Someone who doesn’t play with a lot of feeling. Tag – Used to end the tune, where the last phrase is repeated. Train Wreck – Where a piece of music or performance is completely botched. Wail – To play extremely well. Wax a disc – Cut a record. Wig/Wig out – To flip out. Woodshed (or Shed) – To practice. Rhythm – Who Can You Blame? Rhythm… Some people have it and some people don’t, but why? Research suggests that your parents may be to blame, or thank, depending on which end of the spectrum you ended up. In an article published by the Associated Press, research revealing that babies develop rhythm when they are bounced. The same went for singing to a child – researchers found that babies have the ability to already recognize melodies when they only a few months old. Laurel Trainer was the first to study this relationship between movement and music using 16 seven month old infants to test her theories. Half of the infants in the study were bounced on beats two and four while the other half were bounced on beats one and three. The study found that the babies developed preferences for music with the patterns that they were bounced to. Further study also showed that babies did not pick up rhythm by merely watching someone else – they had to be moved. So what do you think? 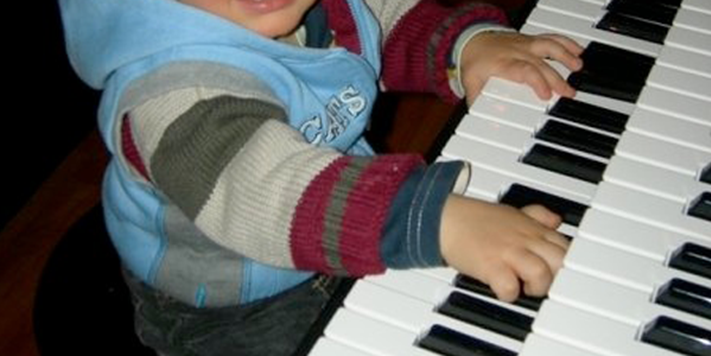 Do we develop our basic sense of rhythm and melody during our infancy?